Tonight, I will light three candles for the third night of Hanukkah. As I’ve written before, Hanukkah is a fairly minor Jewish festival. It commemorates the victory of the small but mighty band of Maccabees who fought against the army of King Antiochus. Antiochus wanted to outlaw the practice of Judaism. When the Maccabees liberated the temple in Jerusalem, it had been desecrated and so needed to be cleansed. The story goes that there was only enough oil to light the holy menorah over the altar for one night, but a miracle occurred, and the oil lasted for eight nights, enough to allow more oil to be prepared. Every year I ponder why this festival is significant, and there are many explanations. This year, I’m focusing on the concept of “dedication,” which is the translation of the Hebrew word “Hanukkah.” In the case of the holiday, it refers to the Jews regaining control, cleansing and rededicating the temple. For me, this year represents my rededication to myself. There have been many dreams in my life that I’ve allowed to fall by the wayside. I’ve focused on my family, my career and the many responsibilities I’ve taken upon myself. But I’ve also begun to feel the urgency of time and the drive to revisit some of those old dreams before it’s too late. I read a post recently on social media about the various famous people who had begun their careers later in their lives, many after already achieving success in some other profession. It reminded me that regardless of my current age, there is still time and a place to realize some of my goals. The key is to stay focused and to be realistic. This year, I am dedicating myself to figuring out which of my early dreams to pursue and to create a plan to achieve them. I also dedicate myself to letting go of those dreams that are the stuff of childhood. I was a pretty dreamy child, spending my afternoons lying in the grass looking up at the clouds, creating stories about my life. When I wasn’t outside, I was curled up with a book, imagining myself in the words of someone else. As an adult, I have often felt disappointed that life isn’t the fairytales of my youth. So now it’s time for me to separate the fairytales from the reality of my life. What can I achieve? 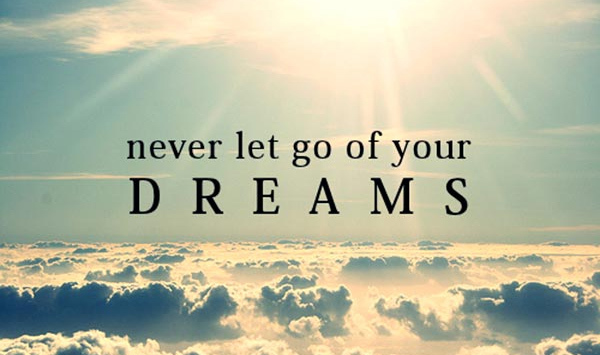 What dreams do I want to hold onto and pursue? What am I ready to let go of? And, in this darkest part of the year, how will I find the light to guide me on my path? Tonight, I will light three candles, and one more every night until all eight are illuminated. And this week I will dedicate myself to remembering that I can carry that light with me all year. On more thing. For those of you who followed my adventures in gardening this summer, I have a few final pictures. The last pumpkins have been harvested, cooked and turned into pies and my sweet potatoes continue to fill us up. Most recently, they were a yummy stuffing on Thanksgiving. Enjoy! Barbara Dab is a small business owner, journalist, broadcast radio personality, producer and award-winning public relations consultant. She is the proud owner of Nashville Pilates Company, a boutique Pilates studio in Nashville’s Wedgewood/Houston neighborhood. Check it out at www.nashvillepilatescompany.com. She is also the creator of The Peretz Project: Stories from the Shoah: Next Generation. The Peretz Project, named for her late father-in-law who was a Holocaust survivor, is collecting testimony from children of survivors. Visit http://www.theperetzproject.com. If you are, or someone you know is, the child of survivors of the Shoah, The Holocaust, and you would like to tell your story please leave a comment and Barbara will contact you. Growing up I had big dreams, and don’t we all? From ballerina to movie star to maybe even first woman President, my dreams ran the gamut. For many years I actually pursued my dreams of being a professional actress and even earned some money from acting jobs. But alas, over time I realized the life of a starving artist just wasn’t for me and I moved on. Dreams die hard, though, and through the years my creative self has continued to bubble up in various ways. When my children were young I owned a small business franchise that offered classes for parents and their toddlers. The classes were focused on nurturing socialization and movement but also included music and dance. Leading the classes gave me an outlet for my performing skills and used my musical theater training experiences. Owning a business also taught me some real-life skills in marketing, networking, accounting and personnel development. I gained confidence and built my self-esteem in ways I never imagined during my acting days. Once my last child was in school I decided to return to graduate school to earn a degree in journalism. I had always loved writing and finally decided to honor another long-shelved passion for the written word. I chose to focus on broadcast journalism because, again, it gave me a chance to use my performance skills. It was in grad school that my world really changed. News writing came naturally to me and for the first time I felt that my work really matched my inner self. Journalism fed my natural curiosity about the world and the things that both unite and distinguish people from all walks of life. I love telling stories and giving a voice to those unable to speak for themselves and writing and journalism continue to fulfill me. Looking back over the years I have come to realize that each thing I pursued built on skills, interests and dreams that came before. What seemed like random changes at the time now make sense and I see my varied professional choices as logical expressions of pieces of myself. If I could give my younger self any advice it would be: “Trust yourself and honor your dreams and passions. Don’t be afraid of making a mistake.” As I think now about the next phase of my life I am encouraged and fueled by this life lesson. The things that bring us joy are worth pursuing with drive and passion. And it’s never too late to dust off an old dream and figure out how to integrate it into a mature life. What are your dreams? What are you waiting for? Barbara Dab is a journalist, broadcast radio personality, producer and award-winning public relations consultant. She is the creator of The Peretz Project: Stories from the Shoah: Next Generation. Check it out at http://www.theperetzproject.com If you are, or someone you know is, the child of survivors of the Shoah, The Holocaust, and you would like to tell your story please leave a comment and Barbara will contact you.